Apollo is the son of Zeus and Leto and the twin brother of Artemis. This statue with a height of 177 cm shows the god of light, of spring, and the patron saint of the muses playing the cithar. 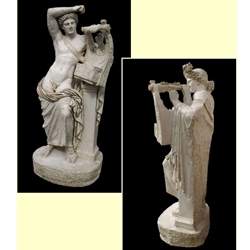 Apollo leans relaxed against a pillar, where the cithar rests. His drapes, slipped down from the body around his waist, are retained by the left thigh. The original work, found in Milet and dated to the 2nd cent. C.E. is exhibited at the Istanbul Museum.